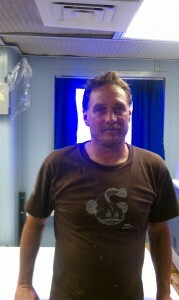 Paul Roussell is an AB (Able Bodied) Seaman aboard the R/V Endeavor. He has worked aboard the Endeavor for over 8 years and has always enjoyed it. When asked why he chose a career on the water he said that he’s “Never had a land job…” I got the feeling that working a land-based job has never crossed Paul’s mind. He grew up on the water and remembers his first job in 1980 as a swordfish and lobster fisherman for two years. After swordfish and lobster fishing for two years aboard a vessel, Paul made the switch to full-time lobster fisherman which he did for 28 years before going back to school. After all of those years on the water Paul decided to study firefighting in New Jersey. After completing his firefighting training and studying day and night for the Coast Guard Able Bodied Seaman ticket, he passed his test and was hired aboard the R/V Endeavor immediately afterward. Like many of the other crew aboard the Endeavor, Paul recognizes a primary drawback to life at sea- the amount of time away from family. To cope with being away he writes poems for his mother back home in Rhode Island and sends them to her daily. He’s been writing a poem a day for over 3 years now. They were recently compiled together and published in a book. You can check out Poems by Paul and keep your eyes peeled for his next book The Spirited Sea, due to come out shortly. Aside from that single primary drawback, when asked about the benefits of being away at sea Paul went on with countless examples of rewarding experiences aboard various vessels; among those experiences he recalls things like seeing baby dolphins swim with their mothers all the way to the ability to travel around the world. After speaking with Paul for a short amount of time it became evident that he truly loves life on the water. Migrateurrice on What’s that smell? Jesse M on What’s that smell? This project was made possible with the support of the National Science Foundation under the following grant awards: 1029739, 1061700, 1029889, and 1029878. The education and outreach aspects of this project are supported by COSEE Networked Ocean World. © 2019 FerrOCious Gulf Blog. All Rights Reserved.